When building a new home, you expect to get the basics, like how many bedrooms and bathrooms you need, but Shearwater’s homebuilders go above and beyond expectations. To bring you the home of your dreams, not just a house, Shearwater’s six homebuilders provide you with a variety of home designs, styles and options for personalization. Choose your favorite floor plan, neighborhood, architectural style and more to create the home that best suits your family. Shearwater has four distinct neighborhoods, each providing residents proximity to different amenities and views. You can be near the Kayak Club, have a pond in your backyard or even live in the Woodlands, Shearwater’s first gated neighborhood. 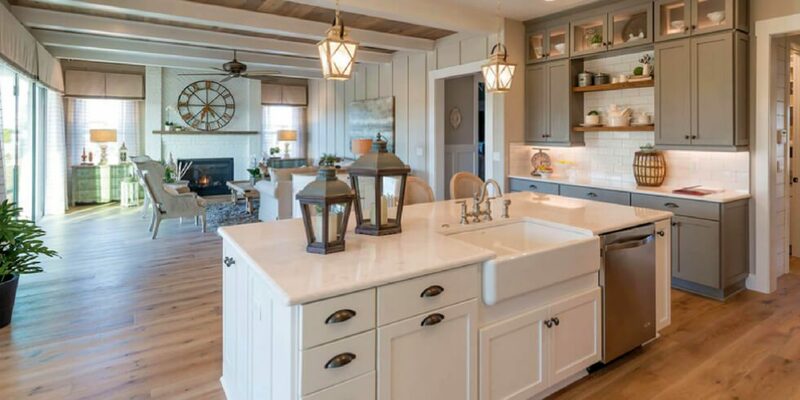 Each of Shearwater’s homebuilders has their own specialty, but all offer multiple floor plans, plus options to include environmentally friendly features and innovative technology like home automation. With so many homebuilders come even more home options. With more than 40 home designs, some available exclusively at Shearwater, you’re sure to find a home perfectly suited to your family. With lot sizes ranging from 40-feet to 80-feet, many homes will have room for that three-car garage you’ve always wanted or a sizeable yard that’s big enough for your favorite outdoor activities. Even better, with home prices from the mid-$200,000s to the mid-$400,000s, you can have a home that not only fits your family but also your budget. Shearwater’s homebuilders offer hundreds of options to make your home fit your lifestyle. Include a wine cellar complete with a chiller and racks to showcase your personal collection, extend the patio for summertime fun or include extra storage space for all the kids’ toys. Swap the formal living or dining room for a study or flex space that can be used for what you really need. You can have an extra bedroom, office, craft room, reading nook or a playroom for the kids or grandkids. The options are endless! At Shearwater, you can make your home match your vision both inside and out. Choose from exterior styles including Florida Bungalow and Craftsman, Spanish Craftsman, Coastal Traditional and Florida Farmhouse. Keep things traditional with a large, functional front porch perfect for relaxing with a glass of wine and visiting with neighbors, or opt for a more modern design with no front porch and sleek, clean lines. You can even choose your home color from eight different options including stylish gray, cheery green, classic white and creamy yellow. Visit our models any day of the week to meet with our homebuilding experts and start building the home of your dreams at Shearwater. To learn more about the homes and lifestyle at Shearwater, join the Founders Club and receive news and updates.